A veteran with PTSD. A retired government worker and cannabis activist with multiple sclerosis. An Ohio transplant who moved here two years ago for Ohio’s medical marijuana program. “I’m ecstatic patients are no longer waiting for relief,” Joan Caleodis said. Alex Griffith, 30, was the second patient at CY+. Griffith drove five hours from his home in Delhi Township in Southwest Ohio to Wintersville on Tuesday so he could be among the first to buy legal marijuana. Griffith, a Marine veteran who suffers from PTSD, left the dispensary with a smile and a sense of relief. 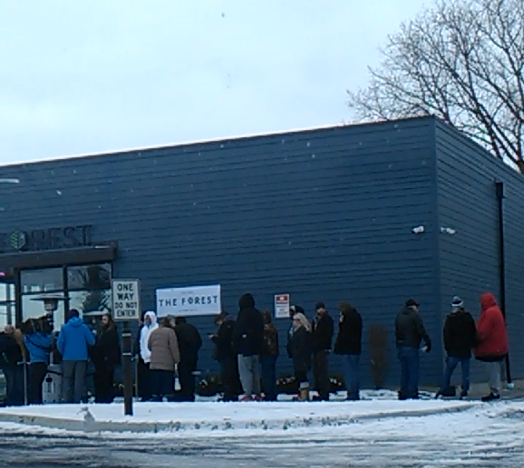 Dispensary owners prepared for large crowds on what is essentially the program’s opening day. They set up heated tents for waiting customers and served coffee and hot chocolate; food was prohibited by the state’s strict rules for the industry. Prices will be steep, even compared to other regulated markets. There could be problems with newly in-place software used to track every plant from seed to sale. The state’s patient registry opened just five weeks ago, and about 4,000 patients have completed the registration process. Ohio law allows patients with one of 21 medical conditions to buy and use marijuana if recommended by a physician. Only 374 doctors have been approved to recommend marijuana and start the patient registration process, and many of them aren’t yet participating. Opening day won’t be a reality for much of the state until more dispensaries open this spring. Dispensary shelves will initially be stocked with a few dozen strains from a few cultivators – 29 have been licensed to grow but only 14 are actually growing plants. None of the state’s licensed processors has passed a final inspection, so the only product available at first will be dried flower, or bud. “States that create a high regulatory hurdle need to be ready for the additional burdens it places on state agencies and applicants as programs get off the ground,” Lindsey said. “Otherwise, a lot of the patients these laws were created to help won’t experience the benefits until several years after they are enacted.